So, how do we begin to reduce these numbers? The first step to solving this issue is to induce business owners and managers to proactively manage health and safety to minimize the chance of an accident or illness occurring. 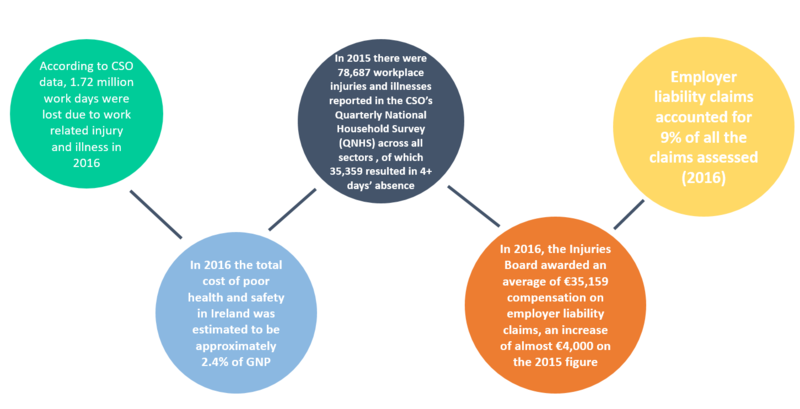 BeSMART.ie is an innovative resource which was developed by the Health and Safety Authority in 2011 as a free, electronic safety management and risk assessment tool for business. BeSMART.ie allows business owners and managers to prepare risk assessments specific to their business in a way that is user-friendly, downloadable, editable and available 24/7. Maybe, most importantly, it is also free of charge. This confidential service, will save businesses time and money, but, more importantly, it will help identify measures to protect employees and others. This in return, will help protect the business viability by reducing the chances of an accident or ill-health. Since its launch, BeSMART.ie has been continually improved, with more new business types and risk assessments being added. What is expected of a business when completing a risk assessment? It is evident from analysis of the Authority’s inspection data that many businesses both large and small have developed safety statements and risk assessments. However, it is also evident in a lot of cases that what was written down was either not understood or not applied on the ground. It is important for a business to understand what is expected of them when completing a risk assessment, to ensure that the appropriate controls are in place for the task in hand. This is where BeSMART helps users, as it enables them to comply with the standard (IS EN31010:2010) and technique (B4 checklists) required. For business owners, this means that they can have piece of mind when assessing risks. Used correctly, BeSMART.ie not only provides the user with relevant risk assessments, but also identifies where there may be shortcomings, generating an action list to prompt the user to raise their safety standards. As part of this action list the user can assign responsibility for each action to an individual and a time-frame within which it should be completed. Being able to offer clients access to a free, secure and robust resource that can raise safety standards, is of vital importance in today’s competitive landscape. Anything which can help reduce the losses associated with a workplace accident or ill-health has to be a win:win for both the insurer and the business. You can find a range of guidance information, videos and other useful materials in the ‘Learn More’ section of BeSMART.ie and can access the HSA’s e-learning portal from the site. There are introductory health and safety course for employees, employers and business start-ups available too. These short courses inform learners as to their responsibilities when it comes to health and safety, and what actions they can take to keep themselves and their colleagues safe. Managers can set up a group for their employees to prompt them to complete the course, where upon successful completion they can download a certificate. While it is not a formal qualification, this certificate can form part of an employees’ training record and, like everything on BeSMART.ie, it’s absolutely FREE! For more information, you can head to the BeSmart.ie website or to one of our regional CPD lectures where you can chat to one of the HSA Inspectors about BeSMART for yourself.